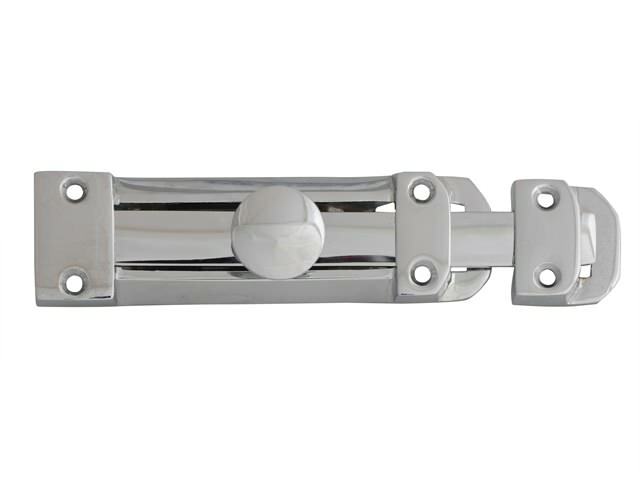 SKU: FGEDBLTHVCH6 Category: Door Chains, Bolts & Viewers Brands: Forge. This Forge Door Bolt is heavy-duty and yet still decorative. It is made from solid brass and lacquered to prevent discolouration during use. Ideal for internal doors and for use as secondary security. 1. Position door bolt on the door face so that the end of the doorbolt is in line with the door edge and mark the screwholes with a pencil. 2. Drill pilot holes using a Ø2mm drillbit and fasten in place using supplied screws. 3. If being installed on an inward opening door:- Position the bolt keep onto the door frame, and ensure that the bolt moves freely through the hole. it may be necessary to remove part of the frame with a chisel. Made from solid brass and chrome plated.